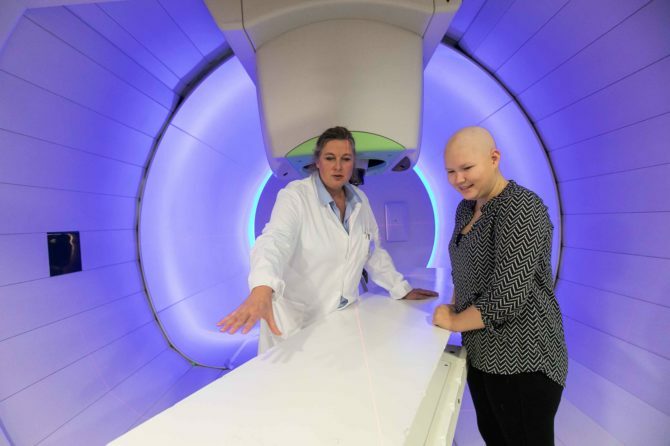 The West German Proton Therapy Centre Essen (WPE), part of the University Medical Centre of Essen and located on the campus of University Hospital Essen, is delighted to celebrate a very special anniversary as we approach the Christmas season: a 15-year-old girl, Lena, has become the 1,000th patient to be treated by WPE. “The WPE team can be very proud of all that has been achieved, with great dedication and expertise, in helping cancer patients over the last 4 years. Treating our 1,000th patient makes this very tangible for everyone,” said Prof. Dr. med. Beate Timmermann, WPE Medical Director and an expert in radiation therapy, brain tumours and sarcomas in both children and adults. Patient treatment commenced in the middle of 2013 in a single dedicated treatment room and has been expanding ever since, with four WPE treatment rooms now in operation. The range of treatments has also gradually grown over this period, with more and more types of disorder now able to be treated by our team. Given the predominance of young adults and children treated here, the average age of patients at WPE is very low (currently 15.9 years). Around half of our patients are under the age of 18, and that includes our 1,000th patient, Lena. WPE is now the largest radiotherapy centre in Europe dealing with childhood cancers, and is also treating growing numbers of adults from Germany and across Europe. Our 1,000th patient, Lena, is 15 years old and was diagnosed with a brain tumour in 2016 – a germinoma, which is a type of germ cell tumour. Using protons to treat Lena’s tumour is beneficial, not just because of her age (proton therapy being a standard method of treatment for childhood tumours) but also because brain tumours in particular have a lot of surrounding tissue in need of protection, and proton-based radiotherapy is particularly easy on such tissue. The physical properties of protons make it possible to direct the irradiation field onto the tumour with great accuracy. Unlike photons, protons release their cell-destroying energy into the tumour – instead of losing much of it en route. Directly behind the tumour, this energy has already disappeared in such a way that the tissue there receives no radiation. This is especially important with brain tumours, in order to avoid damage to important areas such as the optic and auditory nerves and other healthy parts of the brain, thereby reducing the risk of subsequent secondary tumours. As well as precise control of energy delivery, another advantage of protons is the depth of penetration. At WPE, protons can be made to reach tumours that are up to 30cm deep. This is of great help in treating brain tumours, and also sarcomas and prostate cancers. In this way, the path of radiation being directed at the tumour can be chosen in such a way as to pass through less sensitive organs or tissue, even though this may involve taking a longer or deeper route. Brain tumours and tumours of the central nervous system (e.g. astrocytomas, meningiomas or, as in Lena’s case, germ cell tumours) currently account for almost 50% of disorders treated at WPE – and this figure can be as much as 60% among children. Almost one third of all indications treated here to date are sarcomas (e.g. chordomas or chondrosarcomas). However, many ENT tumours and prostate cancers can also be treated very effectively using proton therapy, and are being seen in increasing numbers at WPE. Looking ahead, treatment for further disorders is planned, including moving tumours and ocular tumours. “This important milestone confirms two things: the high level of professional expertise of Prof. Dr. Beate Timmermann and her team, and equally the major success of building this team and such challenging technology from scratch, and linking it into the network of experts we have here at the University Hospital. WPE currently treats 50 patients per day as well as undertaking a wide range of accompanying research activities. This underlines the flagship nature of WPE – not only within the University Medical Centre of Essen, but equally for the state of North-Rhine Westphalia, something of which we are all proud,” emphasized Prof. Dr. Jochen A. Werner, CEO of the University Medical Centre of Essen.